A few years back a friend of mine asked me to build a Korean war aircraft for her father who served on the USS Boxer in Korea. 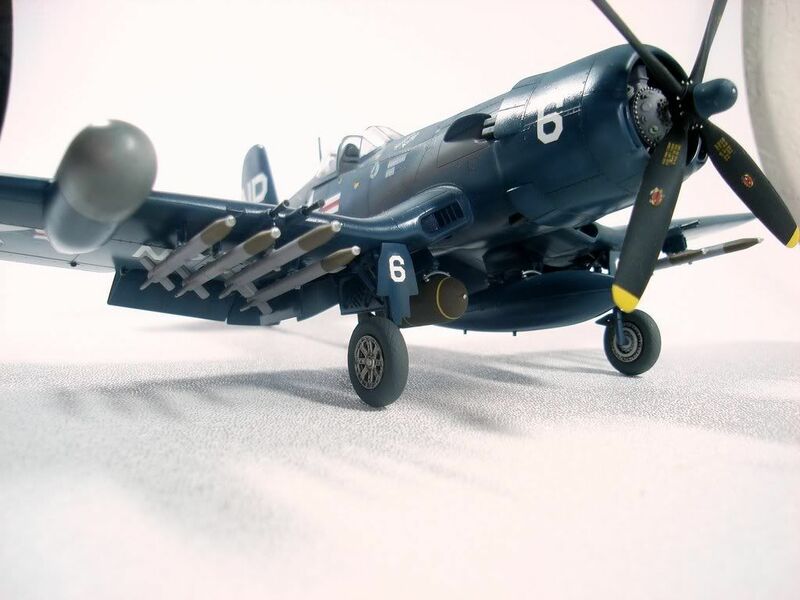 I built her this F4U-5N from Hasegawa to give to her dad. The model is almost OOB, but I did add PE seatbelts. Paints are Gunze Acrylics. Geoff – first rate panel shading. One query though – with that loadout, should we not expect a little flatting on the tyres? Lovely build though – clean and mean. You are probably right Rob. I just used the kit tires and did not do anything with them. Although on carriers, the tires were kept at pretty high pressure so maybe I have an excuse! Anyway- a fine build n this scale. Well done. 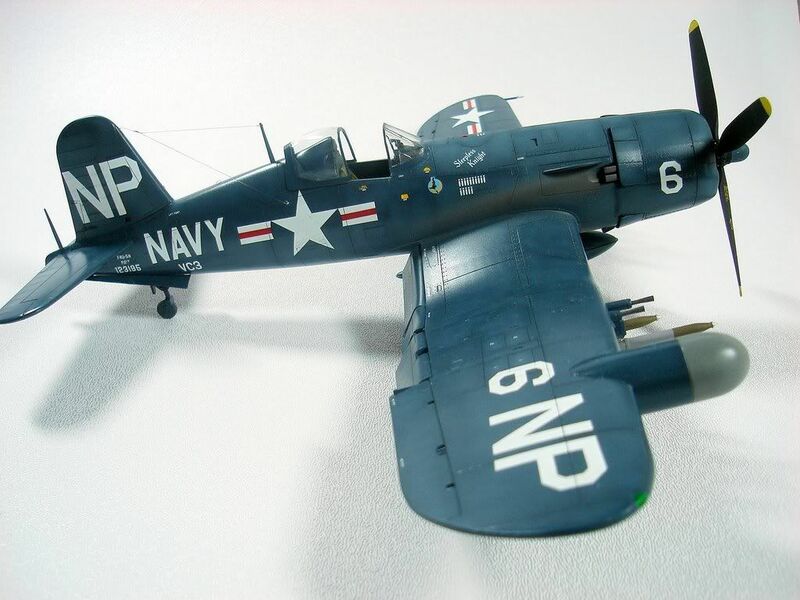 Another great Corsair! I particularly like the Korean War machines “loaded for bear” with the bombs and rockets. Nicely done and good photos as well. I like the finish, just the right sheen. She looks ready to go. 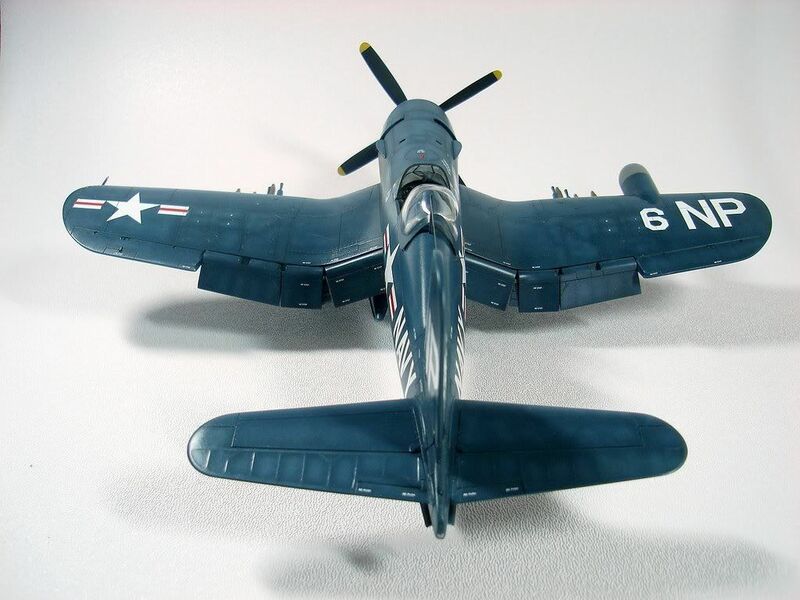 Your F4U-5N came out super…just like the real thing. I had the greatest experience last July when I was able to ride in one of the fabulous warbirds (2.1 hrs in fact). This particular F4U-5NL had been modified with a jumpseat behind the pilot. In spite of the blue-tinted windows, the view was suprisingly good from back there. 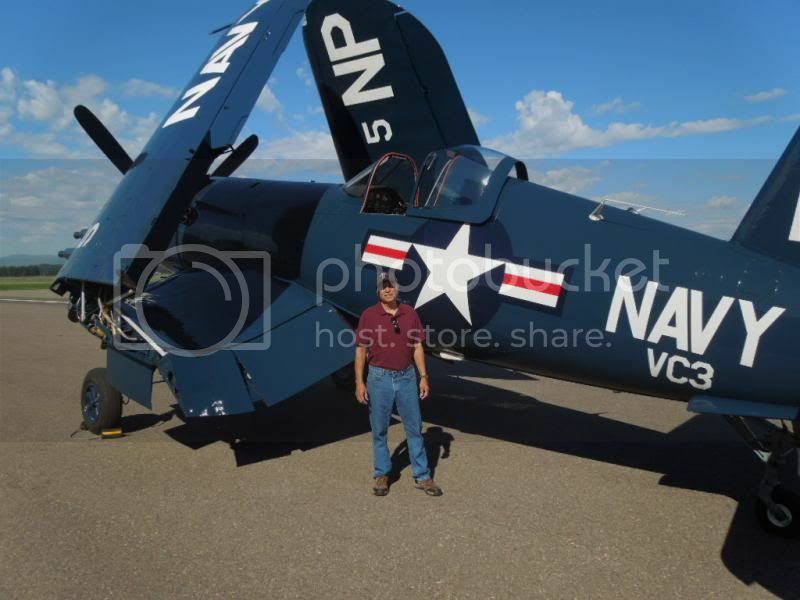 I can tell you, there is no better experience that getting to experience some rolls in a Corsair…simply fabulous. That must have been a cool ride! These late model Corsairs have an absolute brute of a radial engine. Take off pictures show them with almost full right rudder and a lot of aileron, almost look like on the limit of control with that monster engine’s torque and slipstream! I think those motors were close to 3000Hp? Very nicely done model! Nice clean build, well photographed. Love the color of the paint scheme, what shade of blue was used? 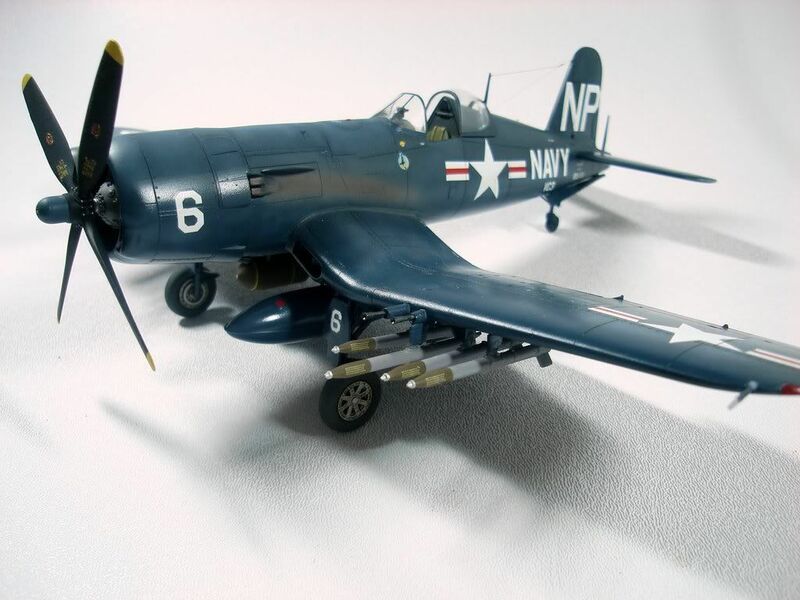 By the way didn’t the Navy use hard rubber “run flat” tires on their Corsairs, causing the tires to look perfectly round….nudge nudge, wink, wink. The headline picture looks terrific, Geoffrey, but for some reason I can’t see the other pictures, I just get blank squares with a little ‘x’ in them. Other headlines articles work OK, it’s just this one. Any ideas anyone? Geoff, What a Beautifully built Corsair! I also really like your work the shading you did-really a mean looking Navy nocturnal Beast indeed. Absolutely beautiful piece of work you have done here. Not only is the 5N a gorgeous airplane, you have made it shine. I am sure that your friends father as happy with this model and you Gould be proud that you did it for him. 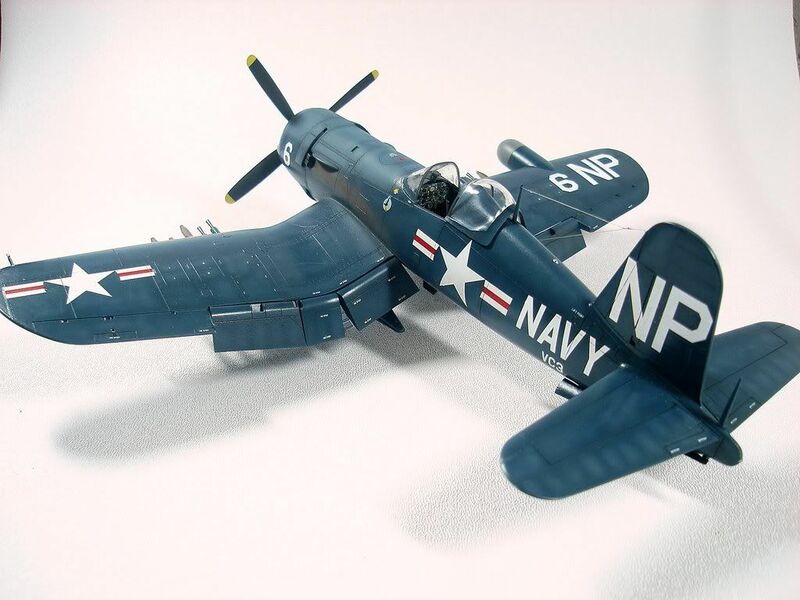 Well presented Corsair, my favorite WWII Navy/Marine fighter, the weathering is something for me hard to achieve on a GSB scheme. Great technique, the markings also really pop in your images. Excellent, thanks for sharing. A lovely kit & a beautiful build. I especially like the subtle panel shading. You’ve done a really great job Geoff.